Joey. Joey boy. . .I promised I'd never let anything bad happen to you. . .but you have to go away with that man. . .he's called Major Nicholls. . .he's promised we'll be together again. So you do yourself proud in France, Joey. You drive those Germans out, then you come home, it's just a few months, you'll be back by Christmas, you will.— Albert who would gladly go overseas with his beloved horse if he were old enough. I've always been a sucker for horses and horse stories, and horseback riding was my favorite weekend acitivity for years. The closest I ever came to a sense of really knowing a horse I rode was during many wonderful weekends spent at a long defunct ranch style hostelry near Rhinebeck, New York where a specked white horse named Freckles became my horse each time I stayed there. Freckles will always have a special place in my memory book of best, emotionally satisfying life experiences, but now another horse — a bronze-hued horse named Joey, ingeniously constructed from wicker, wire and leather — has now galloped straight into my heart, and to the top of unforgettable, unparalelled events in my theatrical memory book. 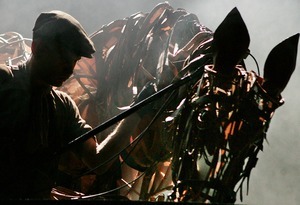 Of course, you don't have to be a horse lover to be totally bowled over by War Horse which metamorphosed from a less than spectacularly successful book for the 9 to 12 set into a truly unique theater piece with a heart-tugging, imagination stirring hero unlike any other. Though Joey is the star of this remarkable enterprise, puppet designers Basil Jones and Adrian Kohler of the Handspring Puppet Company have also created Topthorn a fellow four-legged World War I draftee as well as an "ensemble" of other war horses and a delightful goose on wheels. Courtesy of Nick Stafford's adaptation of Michael Morpurgo's juvenile novel, which was actually narrated by Joey, there's also a large cast of human characters besides Albert, the other half of this boy-loves-horse story. Stafford has deepened Albert's family situation and the sense of the madness of war symbolized by the suffering inflicted on the noble horses. (According to a program note of the million English horses taken to France during World War I only 62,000 came back). The National Theatre couldn't have wished for a more perfect venue to do full justice to this thrillingly eye pleasing production. Lincoln Center's Vivian Beaumont three-sided thrust seating area allows the actors and puppets to make use of the aisles and the deep stage handily accommodates Rae Smith's design with its backdrop to illustrate various scenarios in England and France. The large cast and breathtaking on stage as well as projected images have the grandeur of an epic, but an epic that never loses its sense of intimacy. I'll let our chief London critic Lizzie Loveridge's two reviews of the show (posted after the production notes of these remarks) provide you with details about the plot and Marianne Elliott and Tom Morris's brilliant staging. Like Lizzie, I was smitten the moment Joey as a skinny-legged foal came on stage and enthralled to see this baby Joey magically turn into a life-sized young colt. I too realized that Joey was being manipulated by three actors without the reality of the stagecraft at work hindering my imagination from allowing me to see a "real" horse. This ability to see beyond the movement control by the puppeteer-actors held beyond the bonding of boy and horse, to the war scenes when Topthorn and the other War Horses join the fray. I'm happy to report that the American actors couldn't be better. Seth Numrich brings intense and utterly convincing passion to young Albert Narracott. The rest of the Narracott family is also ably portrayed. Boris McGiver and T. Ryder Smith are funny but sad as Albert's misguided father and uncle. Alyssa Bresnahan is terrific as the crusty family peacekeeper, money manager and loving mother. Also notable is Peter Hermann making his Broadway debut as the German officer who sums up the use of proud stallions like Topthorn and Joey as cart horses for artillery as a metaphor for both his countrymen and the British gone mad. Despite Stafford's savvy broadening of the Morpurgo novel and the incredibly inventive staging, the book's kid-lit oriented roots are evident in the facile coincidences and scenes shamelessly tugging at vulnerable emotions. A more conventional adaptation would hardly have made this the hit it's been in London or that it's well on the way to being at Lincoln Center (The initially announced limited run has already been changed to an open ended run). But the marvelous coming together of puppetry, stagecraft and story telling is irresistible. I didn't weep and gasp like some of the women sitting near me, but I did choke up at Topthorn's agonized final scene and Joey and Albert's inevitable reunion. To paraphrase Albert's exultant "What a team we make! Albert and Joey together for ever" . . . What a team Michael Morpurgo, Nick Stafford, the Handspring Puppet Company, directors Marianne Elliott and Tom Morris, and the two and four-legged cast make! I'll remember War Horse for ever — and so will you. Sets, costumes & drawings by Rae Smith. Cast (with people): Zach Appelman (Soldat Schnabel/Sergeant Fine), Alyssa Bresnahan (Rose Narracott), Richard Crawford (Sergeant Thunder), Sanjit De Silva (Doctor Schweyk), Matt Doyle (Billy Narracott), Austin Durant (Chapman Carter), Joby Earle, Joel Reuben Ganz, Alex Hoeffler or Jonathan David Martin (John Greig), Peter Hermann (Priest/Hauptmann Friedrich Müller), Brian Lee Huynh (Capt. Charles Stewart), Boris McGiver (Ted Narracott), Seth Numrich (Albert Narracott), Bhavesh Patel (Thomas Bone/Oberst Strauss), David Pegram (Pvt. David Taylor), Kate Pfaffl (Song Woman), Stephen Plunkett (Lieut. James Nicholls), Liam Robinson (Song Man), T. Ryder Smith (Arthur Narracott), Elliot Villar (Allan/Soldat Klausen) and Cat Walleck (Paulette). Cast (with horses): Stephen James Anthony, David Pegram and Leenya Rideout (Joey as a Foal); Joby Earle, Ariel Heller, Alex Hoeffler, Jeslyn Kelly, Jonathan David Martin, Prentice Onayemi, Jude Sandy, Zach Villa or Enrico D. Wey (Joey); Mr. Earle, Joel Reuben Ganz, Ms. Heller, Mr. Hoeffler, Jonathan Villa, Tom Lee, Jonathan Christopher MacMillan, Mr. Sandy, Mr. Villa or Mr. Wey (Topthorn); Mr. Earle, Mr. Ganz, Mr. Hoeffler, Ms. Kelly, Mr. Lee, Mr. Martin, Mr. Villa or Mr. Wey (Coco); and Sanjit De Silva and Bhavesh Patel (Heine). What Michael Morpurgo's novel does is to place the horse centre stage, so that episodes in the First World War are seen from an equine point of view. The curious effect is that in this "war to end all wars" you realise that on the opposing side are good men who love horses. You hate what war does because horses get hurt and killed or die of overwork and malnutrition. But how to stage a play where the central character is a horse? Never for one moment did I think a production based on puppet characters could engage me emotionally but I was blown away from the very first moment of watching the foal onstage. My brain told me that there were three actors managing the colt's body but in my heart I was convinced that I was watching a young animal running around a paddock. There are two things to admire about this lovely play. To begin with there's the sheer technical brilliance of the engineering, the perfection of the horse's body and how it works — this is what the men talked about at the interval. Then there is the visual and emotional realism, a horse that twitches its ears and breathes and moves like a real animal, eats grass and whinnies and has a human rider on its back: the leap that your imagination can make so that you believe you are watching a live horse — this is what the women talked about at the interval. Of course this is where subsidised theatre comes into its own. Only the National Theatre has the resources to develop and perfect how life size horses are portrayed on stage. The movement of the animals, even the small goose that was pushed along by an actor, hisses and flaps its wings and is very real., creating a sense of wonderment. The initial relationship in the play is between a boy and his horse. Albert, the boy, (Luke Treadaway) tries to entice the colt to feed from a bucket. Joey, the horse, is a chestnut hunter, a cross between a strong, maybe a draught horse and a racing thoroughbred. John Tam's folk music adds to the atmosphere as the young horse is patiently trained to plough to win an impossible bet recklessly laid by Albert's father Ted Narracott (Toby Sedgwick). Although Albert's father agrees he can keep the horse, the father breaks his word and Joey the horse is sold to the army as a mount for an officer. Joey goes to France and Albert is given an unwelcome consolation Christmas present of a bicycle. In France Joey serves in a battle, sees his rider killed, meets Topthorn a thoroughbred horse, and is later taken by the Germans where he learns to pull an ambulance. Joey's ploughing experience saves his life. Angus Wright plays Hauptmann Friedrich Müller, a German officer and equestrian who rescues both Joey and Topthorn from warfare. Later Joey and Topthorn are made to pull a heavy gun and Topthorn tragically dies of exhaustion. Joey is stranded in No Man's Land, gets entangled in the barbed wire but miraculously is reunited with Albert, by now in the army but blinded by a gas attack. Joey's life still hangs in the balance. The constancy here is the relationship between boy and horse. Albert's father fails him in many ways although his mother (Thusitha Jayasundera) tries for fairness, she is unable to make her subsistence farming husband keep his promises and she tries to explain to her son why. Nick Stafford has adapted the novel into an ensemble piece with many of the actors playing several different parts. Basil Jones and Adrian Kohler for Handspring Puppet Company have achieved wonders with the horses, made from wicker and wire and leather frames like a design net and with moving joints from withers to fetlock. I remember seeing Equus for the first time and being impressed with the characterisation of the horses but War Horse takes the staging of these beautiful creatures to another level. If I have a niggle, it is the choice of a puppet to play the small French girl Emilie. Unlike the horses, I was always conscious that she was a doll. The First World War battlefields are realistic enough to be disturbing and I would strongly recommend that children under twelve are not taken to this play which may of course be why Emilie has to be a puppet! Rae Smith's design incorporates a swathe across the sky of what looks like torn cartridge paper on which are animated her pencil and charcoal drawings of clouds across the landscape or scenes from the war. Lit from behind, this backdrop is very effective at adapting to different scenarios and the huge Olivier stage never feels too large. Later at the height of battle the torn paper soaks up a stain of blood which spreads until all is stained red. The second act found many reaching for handkerchiefs such is the heightened emotion of the narrative. I really did not expect to see War Horse as a contender for Best Play, but now I do not see how it could fail to be nominated. The National Theatre's sell out play about horses in the First World War transfers to the New London Theatre, a perfect circular space which can recreate the Olivier's staging. On a second look, the magnificent horses, (the title "puppets" seems to somehow diminish their dignity) are still the real show stoppers. These elegant creatures make the humans look wooden by comparison. I know that the weakest aspect of Michael Morpurgo's book and Nick Stafford's play was the human characters and the unbelievable coincidences that drive the narrative but a second viewing just emphasises that all we are interested in is the fate of the horses and only relate to the people when they are essential to the survival and welfare of the four footed. 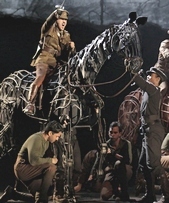 War Horse is a play that you visit for the roller coaster emotion of seeing a beautiful horse ridden on stage and for the magnificent design of scenes in charcoal projected on a huge torn swathe of cartridge paper which forms the back drop to the action. The war scenes too are very powerful with smoke and a tank looking like a vehicle from a futuristic Mad Max or Terminator movie. On this viewing I was annoyed by some actors spinning out their parts and by the overly lush West Country regional accents. I was pleased to see that the child puppet Emilie had been replaced by a small actor (Bettrys Jones). It's always hard to know whether the first viewing has tempered one's perception or whether Ted Narracott (Colin Mace) has been toned down to appear less of a two dimensional villain. Ironically I preferred him really mean. What is sure was that Bronagh Gallagher's almost hectoring Rose Gallagher was far less sympathetic when compared to the colour blind casting of Thusitha Jayasundera as the boy's mother. Maybe there have been some doubts about the acoustic quality of the New London compared to the National and actors have been told to project their voices or to slow down because, even that excellent actor Patrick O'Kane as the sympathetic German Freidrich Müller, seemed over the top, and the press night over ran by an astonishing 35 minutes. The people movemnt at the intervals at the New London take longer because of the fewer number of exits and entrances. I was still moved to tears by the terrible fate of the horses and the magnificent staging but this time was also conscious that I was being manipulated! Don't forget the box of Kleenex and don't miss War Horse for the genius of Basil Jones and Adrian Kohler's state of the art horse designs for the Handspring Puppet Company and Toby Sedgwick's movement and horse choreography, just like the real thing.